I like an eclectic approach when visiting a new city. If my time there is planned by an “insider,” that’s even better. I like seeing some of the main tourist sites, but also want to drill down a bit and experience what the locals do with their time and dollars. I appreciate a bit of history, but I what I really enjoy is getting to know a city through its food, wine, shopping, and locals’ favorite destinations that don’t show up in the $30 guide books. I want instant favorites and lasting recollections to be heaped high in my memory bank. Tip 1: Get yourself a driver. No eye rolling please; just put it in your budget. Mr. Eugenidis of Taxiplon was waiting for me as I staggered out of the airport after an 11-hour flight. He whisked my companion and me into his sleek Mercedes car, which was decked out with a spotless interior, cool, soothing bottles of water, and smooth jazz wafting in the background. It was my first Greek “ahh…” moment. Mr. Eugenidis would be our constant companion for the next five days, and he knew everything about anything, cutting out all those silly delays and obstacles one encounters on a first-time visit. We could visit historical sites, a supermarket, a shopping mall, or a museum in style and comfort. If we wanted to stay somewhere for 10 minutes or four hours, he was by our side through the thick and thin of it. He patiently explained local politics and customs. What a guy. You definitely need him. To contact Taxiplon, call +30 6976652653; ask for Mr. Eugenidis. Tip 2: Stretch your horizons and stay in a hotel outside of the normal tourist district. We stayed at Stratos Vassilikos Hotel, about a 20-minute car or Metro ride to the downtown area. 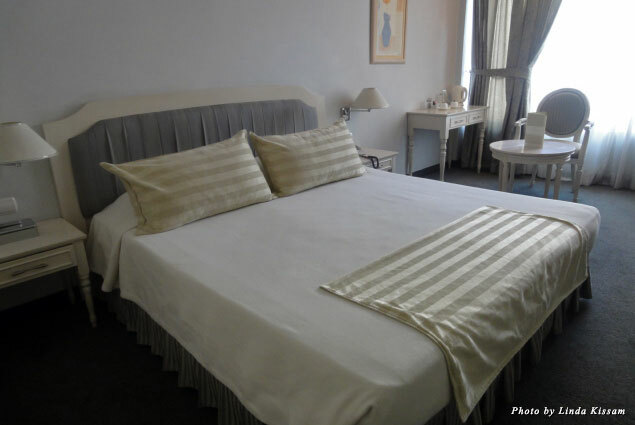 The Stratos is a lovely business hotel showcasing spacious accommodations and character. It’s located in a safe area that is a mix of residences and small local businesses. We loved strolling the streets and getting acquainted with the locals. We also thoroughly enjoyed the concierge staff, the daily Greek breakfast, and the caring staff. We even received a surprise Easter present from the management. I highly recommend this hotel for a better way to connect with the local culture. Tip 3: Take a guided tour on your first full day awake to get acquainted with the city. We chose LocalGuiding.com. Owner John Striligas took us on a four-hour tour suited to our interest and needs, but he has organized ones as well. What was especially nice about this guide was his passion for the area. John, who has been a professional limousine and minivan driver for 10 years, is a history aficionado. His vast knowledge of Greece’s history and historical landmarks was remarkable. There was no question he couldn’t answer, no request he wasn’t able to grant. 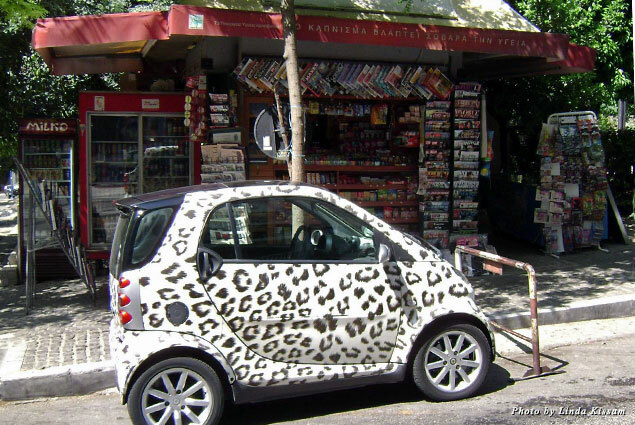 After we visited several of the main historical sites, he was driving us to the Plaka area when I spotted a small, yuppie kind of shopping district called Kolonaki. I asked him to stop so I could get a cup of coffee and a pair of shoes. I think he was surprised at my tour choice, but none-the-less with good humor he gave us the full 411 on the area and parked on a side street as we stroll. It turned out to be an area we returned to several times. Tip 4: Eat local up and down the dollar scale. The “New Greek” cuisine is really something. 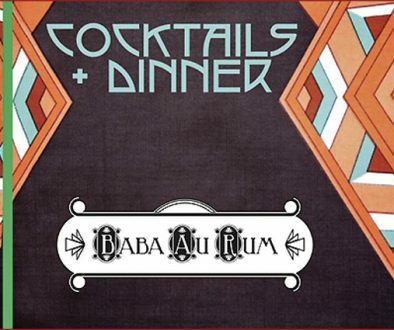 Local chefs are putting twists on traditional menu items that will bring tears to your eyes. Unlike the United States, some of the best fine-dining restaurants are located inside of tourist hotels. I give thumbs up to the elegant, five-star cuisine of the Electra Palace Roof Garden Restaurant. Chef Peter Kalevrosoglou’s dishes were to die for. Heaven on a plate. 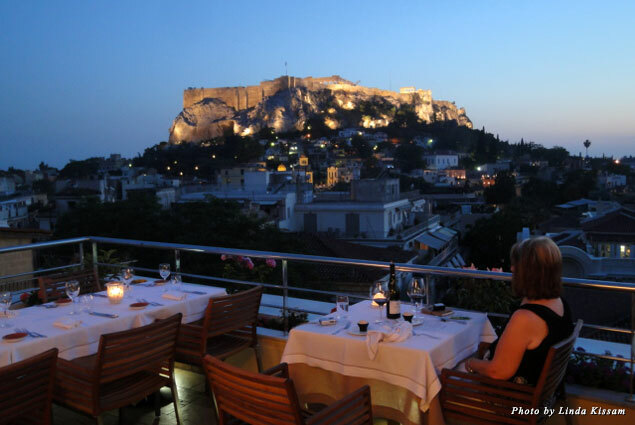 Combine that with the killer nighttime view of the Acropolis and you have the perfect foodie-centered evening. Just down the street is another fine-dining showcase, the Garden Restaurant & Bar at the highly regarded Grande Bretagne Hotel. Wine service is a big part of the attraction here. The food is superb, and the wine list is extensive. This is the best place for the wine geek and anyone who wants to be part of the local New Greek cuisine movement. Superb. 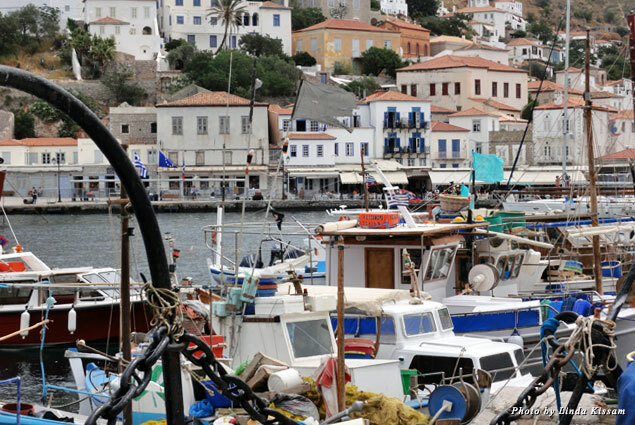 Don’t forget to experience the simpler food a family-run taverna has to offer. 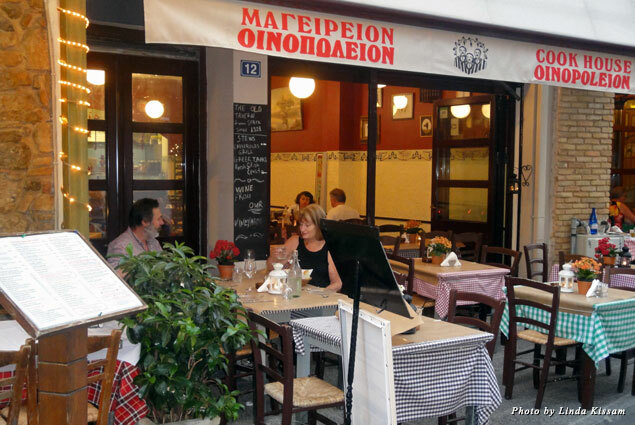 We were lucky enough to be invited to dinner at Oinopoleion Taverna in the wildly popular Plaka District. Oinopoleion means “wine shop.” It has been around since 1928, long before the area became popular as a dining and nightlife destination. 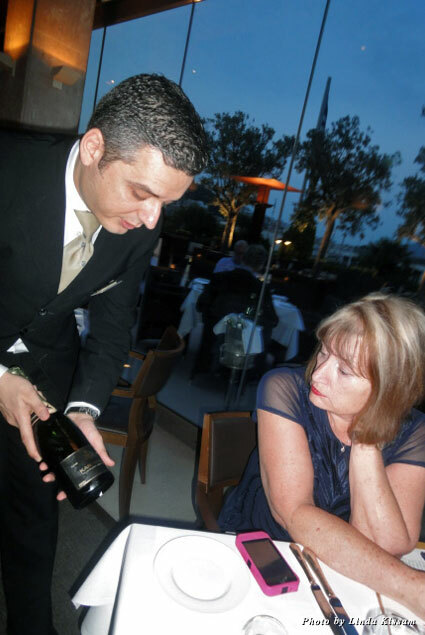 We dined with one of the owners, Spyros Markou. Despite the fact neither of us spoke the other’s language, our guide Aggeliki kept the conversation going, translating between heaps and heaps of yummy local dishes and wine. It was possibly the best night of my travel life. You MUST make it a priority to go here. Jazz music is offered on selected nights. 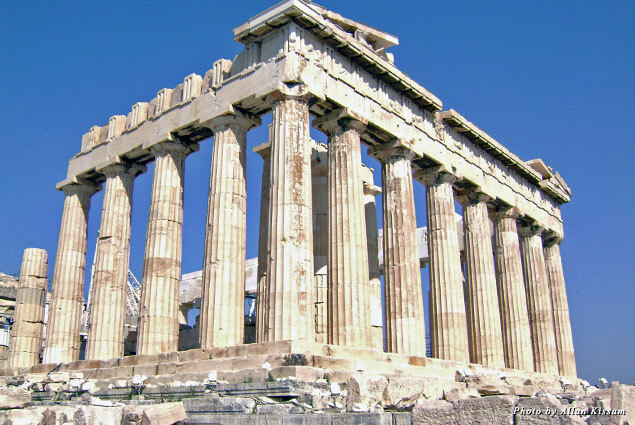 Tip 5: Spend your last night at the Athens airport. Yes, you heard me right. A few steps from your departure gate is the Sofitel Athens Airport Hotel. It’s a five-star facility overlooking the runway. Not to worry, this hotel offers 345 contemporary, soundproofed rooms and suites as well as an executive lounge plus meeting and banqueting venues for up to 700 guests. 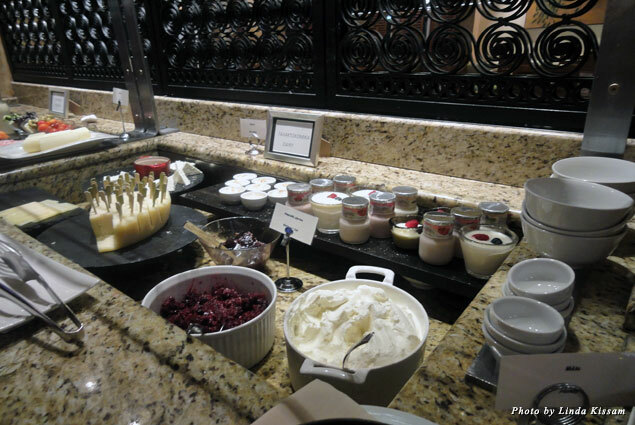 Two restaurants serving 24-hour Mediterranean dishes and gourmet French cuisine are a plus. The morning breakfast choices are a knock-out. I know you’ll appreciate the soundproof rooms, mountain views, and an outdoor terrace that makes you forget you’re at the airport. Indulge in a little swim, sauna, or spa activity in the fitness area. 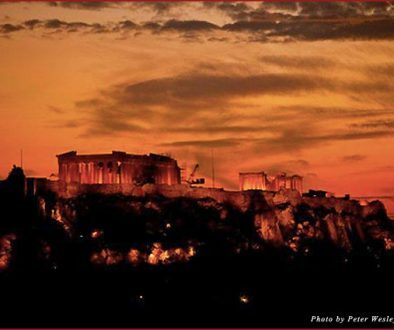 C’est magnifique—and a fitting end to a wondrous six-night stand in Athens, Greece.